Three case studies in one. Following up on their 2012 report, User Experience Management and Business Impact: A Cornerstone for IT Transformation, industry analysts Enterprise Management Associates (EMS) interview three users of Foglight User Experience Management from Dell to underscore the appeal of UEM, its essential value to IT, and just how Foglight is demonstrating versatility in supporting UEM’s multiple facets. 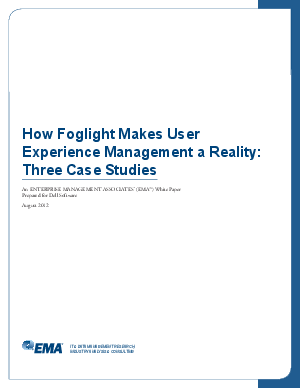 Download How Foglight Makes User Experience Management a Reality: Three Case Studies today to see what top firms in the US are saying about Foglight.